Gaseous oxygen systems are prevalent in general, corporate, and airline aviation. The use of light weight aluminum and composite storage cylinders has improved these simple and reliable life support systems. All gaseous oxygen systems require servicing and maintenance. Various procedures and requirements to perform these functions are covered in this page. Leaks in a continuous-flow oxygen system may be difficult to detect because the system is open at the user end. Blocking the flow of oxygen allows pressure to build and leak check procedures can be followed that are similar to those used in the high pressure sections of the systems. Detection of leaks should be performed with oxygen-safe leak check fluid. This is a soapy liquid free from elements that might react with pure oxygen or contaminate the system. As with leak detection on an inflated tire or tube assembly, the oxygen leak detection solution is applied to the outside of fittings and mating surfaces. The formation of bubbles indicates a leak. Careful assembly of oxygen components and fittings without overtightening or undertightening is required. If a leak is found at a fitting, it should be checked for the proper torque. Tightening may not always stop the leak. If the fitting is torqued properly and a leak still exists, pressure must be released from the system and the fitting must be examined for flaws or contamination. If necessary, the fitting must be replaced. All system components, lines, and fittings must be replaced with the proper parts, which should be cleaned and inspected thoroughly before installation. Follow the manufacturer’s instructions and repeat the leak check when completed. Use caution when maintaining the high pressure portion of a gaseous oxygen system. An open tank valve pressurizes the lines and components with up to 1,850 pounds per square inch (psi) of oxygen. Identify the high-pressure section of the system as that portion upstream of the reducer or regulator that has stainless steel tubing. Note that no attempt should be made to tighten a leaky oxygen fitting while the system is charging. The oxygen supply should be isolated in the cylinder and the system depressurized to reduce the consequences of a spark or to minimize spillage and injury should a complete fitting failure occur. The biggest factor in draining an oxygen system is safety. The oxygen must be released into the atmosphere without causing a fire, explosion, or hazard. Draining outside is highly recommended. The exact method of draining can vary. The basic procedure involves establishing a continuous flow in a safe area until the system is empty. If the cylinder valve is operative, close the valve to isolate the oxygen supply in the cylinder. All that remains is to empty the lines and components. This can be done without disassembling the system by letting oxygen flow from the delivery point(s). If the environment is safe to receive the oxygen, positioning a demand-flow regulator to emergency delivers a continuous flow of oxygen to the mask when plugged in. Hang the mask(s) out of a window while the system drains. 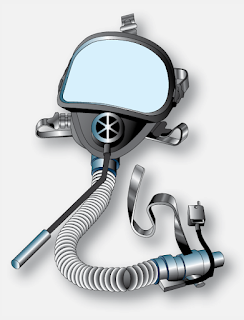 Plug in all mask(s) to allow oxygen to drain from a continuous-flow oxygen system. Systems without check valves can be drained by opening the refill valve. Filling procedures for oxygen systems vary. Many general aviation aircraft are set up to simply replace an empty cylinder with one that is fully charged. This is also the case with a portable oxygen system. High performance and air transport category aircraft often have built-in oxygen systems that contain plumbing designed to refill gaseous oxygen cylinders while they are in place. A general discussion of the procedure to fill this type of installation follows. Before charging any oxygen system, consult the aircraft manufacturer’s maintenance manual. The type of oxygen to be used, safety precautions, equipment to be used, and the procedures for filling and testing the system must be observed. Several general precautions should also be observed when servicing a gaseous oxygen system. Oxygen valves should be opened slowly and filling should proceed slowly to avoid overheating. The hose from the refill source to the oxygen fill valve on the aircraft should be purged of air before it is used to transfer oxygen into the system. Pressures should also be checked frequently while refilling. 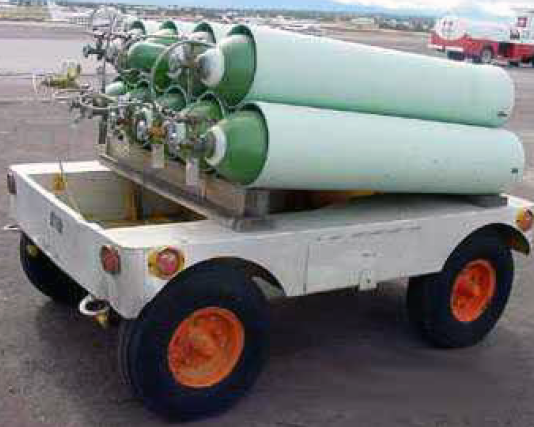 Airline and fixed-base operator maintenance shops often use oxygen filler carts to service oxygen systems. These contain several large oxygen supply cylinders connected to the fill cart manifold. This manifold supplies a fill hose that attaches to the aircraft. Valves and pressure gauges allow awareness and control of the oxygen dispensing process. [Figure 1] Be sure all cylinders on the cart are aviator’s breathing oxygen and that all cylinders contain at least 50 psi of oxygen pressure. 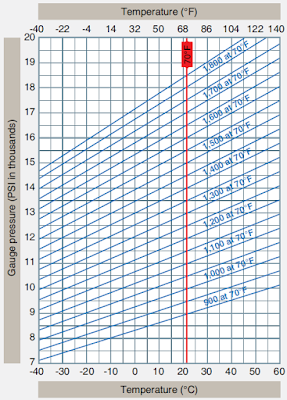 Each cylinder should also be within its hydrostatic test date interval. After a cart cylinder has dispensed oxygen, the remaining pressure should be recorded. This is usually written on the outside of the cylinder with chalk or in a cylinder pressure log kept with the cart. As such, the technician can tell at a glance the status of each oxygen bottle. No pump or mechanical device is used to transfer oxygen from the fill cart manifold to the aircraft system. Objects under pressure flow from high pressure to low pressure. Thus, by connecting the cart to the aircraft and systematically opening oxygen cylinders with increasingly higher pressure, a slow increase in oxygen flow to the aircraft can be managed. The following is a list of steps to safely fill an aircraft oxygen system from a typical oxygen refill cart. Check hydrostatic dates on all cylinders, especially those that are to be filled on the aircraft. If a cylinder is out of date, remove and replace it with a specified unit that is serviceable. Check pressures on all cylinders on the cart and in the aircraft. If pressure is below 50 psi, replace the cylinder(s). On the aircraft, this may require purging the system with oxygen when completed. Best practices dictate that any low-pressure or empty cylinder(s) on the cart should also be removed and replaced when discovered. Take all oxygen handling precautions to ensure a safe environment around the aircraft. Ground the refill cart to the aircraft. Connect the cart hose from the cart manifold to the aircraft fill port. Purge the air from the refill hose with oxygen before opening the refill valve on the aircraft. Some hoses are equipped with purge valves to do this while the hose is securely attached to the aircraft. Others hoses need to be purged while attached to the refill fitting but not fully tightened. Observe the pressure on the aircraft bottle to be filled. Open it. On the refill cart, open the cylinder with the closest pressure to the aircraft cylinder that exceeds it. Open the aircraft oxygen system refill valve. Oxygen will flow from cart cylinder (manifold) into the aircraft cylinder. When the cylinder pressures equalize, close the cylinder on the cart, and open the cart cylinder with the next highest pressure. Allow it to flow into the aircraft cylinder until the pressures equalize and flow ceases. Close the cart cylinder, and proceed to the cart cylinder with the next highest pressure. Continue the procedure in step 8 until the desired pressure in the aircraft cylinder is achieved. Close the aircraft refill valve, and close all cylinders on the cart. The aircraft oxygen cylinder valve(s) should be left in the proper position for normal operations. Remotely mounted cylinders are usually left open. Disconnect the refill line from the refill port on the aircraft. Cap or cover both. When it is hot, oxygen cylinders are filled to a higher pressure than 1,800 psi or 1,850 psi, the standard maximum pressure ratings of most high-pressure aircraft oxygen cylinders. 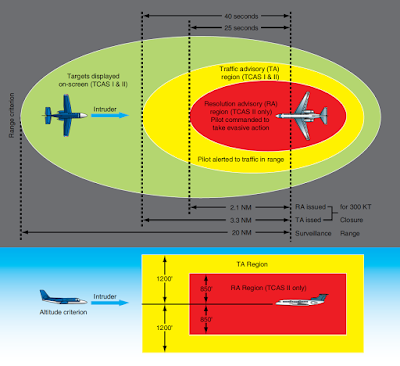 This is allowable because at altitude the temperature and pressure of the oxygen can decrease significantly. Filling cylinders to temperature-compensated pressure values ensures a full supply of oxygen is available when needed. When filling cylinders on a cold day, compensation for temperature and pressure changes dictates that cylinders be filled to less than the maximum rated capacity to allow for pressure increases as temperature rises. Strict adherence to the temperature/pressure compensation chart values is mandatory to ensure safe storage of aircraft oxygen. Note that some aircraft have temperature compensation features built into the refill valve. After setting the ambient temperature on the valve dial, the valve closes when the correct amount of oxygen pressure has been established in the aircraft cylinder. A chart can be used to ensure proper servicing. The inside of an oxygen system becomes completely saturated with oxygen during use. This is desirable to deliver clean, odor-free oxygen to the users and to prevent corrosion caused by contamination. An oxygen system needs to be purged if it has been opened or depleted for more than 2 hours, or if it is suspected that the system has been contaminated. Purging is accomplished to evacuate contaminants and to restore oxygen saturation to the inside of the system. The main cause of contamination in an oxygen system is moisture. In very cold weather, the small amount of moisture contained in the breathing oxygen can condense. With repeated charging, a significant amount of moisture may collect. Additionally, systems that are opened contain the moisture from the air that has entered. Damp charging equipment, or poor refill procedures, can also introduce water into the system. Always follow manufacturer’s instructions when performing maintenance, refilling, or purging an oxygen system. Cumulative condensation in an oxygen system cannot be entirely avoided. Purging is needed periodically. The procedure for purging may vary somewhat with each aircraft model. Generally speaking, oxygen is run through a sound oxygen system for a number of minutes at a given pressure to perform the purging. This can be as little as 10 minutes at normal delivery pressure. Other systems may require up to 30 minutes of flow at an elevated pressure. Regardless, the removal of contaminants and the resaturation of the inside of the system with oxygen is the basis for purging. It is acceptable to use nitrogen, or dry air, to blow through lines and components when performing maintenance. However, a final purging with pure oxygen is required before the system is serviceable for use. It is important to ensure storage cylinders are refilled if they are used during the purging process. Be certain that there are no open lines and all safety caps are installed before returning the aircraft to service. The use of LOX in civilian aviation is rare. The most common and safest way to fill a LOX system is to simply exchange the storage unit for one that is full. However, filling LOX on the aircraft is possible. A portable fill cart is used and all of the same precautions must be observed as when servicing a high pressure gaseous oxygen system. Additionally, protection from cold burns is necessary. Due to the amount of gaseous oxygen released during the process, refilling should be accomplished outside. The servicing cart is attached to the aircraft system through a fill valve. The buildup/vent valve on the LOX container assembly is placed in the vent position. The valve on the service cart is then opened. LOX flows into the aircraft system; some vaporizes and cools the entire setup. This gaseous oxygen flows overboard through the vent valve while the system fills. When a steady stream of LOX flows from the vent valve, the system is filled. The valve is then switched to the buildup position. The aircraft refill valve and cart supply valves are closed and the hose is removed. Note that back seated valves can freeze in the open position due to the low temperature involved while LOX is being transferred. Valves should be opened completely and then closed slightly so as to not be back seated. The wide varieties of oxygen masks used in aviation require periodic inspection. Mask and hose integrity ensure effective delivery of oxygen to the user when it is needed. Sometimes this is in an emergency situation. Leaks, holes, and tears are not acceptable. Most discrepancies of this type are remedied by replacement of the damaged unit. Some continuous-flow masks are designed for disposal after use. Be sure there is a mask for each potential user on board the aircraft. Masks designed to be reused should be clean, as well as functional. This reduces the danger of infection and prolongs the life of the mask. Various mild cleaners and antiseptics that are free of petroleum products can be used. A supply of individually wrapped alcohol swabs are often kept in the cockpit. Built-in microphones should be operational. Donning straps and fittings should be in good condition and function so that the mask is held firm to the user’s face. Note that the diameter of mask hoses in a continuous-flow system is quite a bit smaller than those used in a demand-flow system. 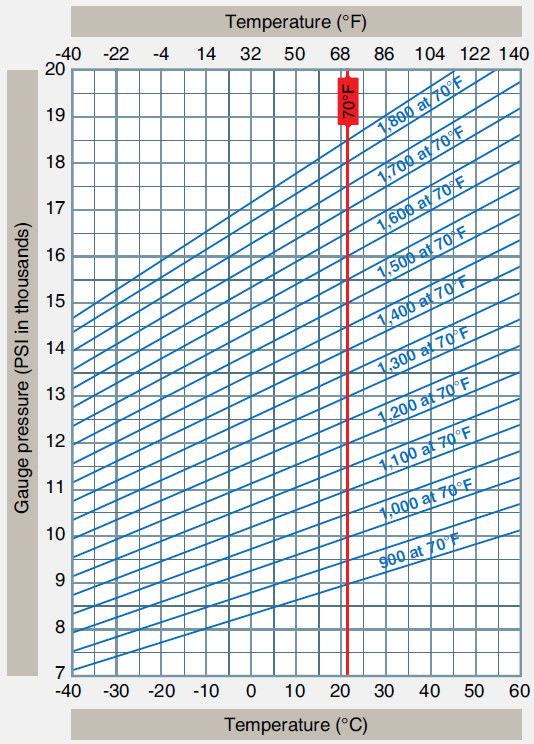 This is because the inside diameter of the hose aids in controlling flow rate. Masks for each kind of system are made to only connect to the proper hose. Smoke masks are required on transport aircraft and are used on some other aircraft as well. These cover the eyes, as well as the user’s nose and mouth. Smoke masks are usually available within easy grasp of the crew members. They are used when the situation in the cockpit demands the increased level of protection offered. Smoke mask hoses plug into demand regulators in the same port used for regular demand type masks and operate in the same manner. Most include a built-in microphone. [Figure 3] Some portable oxygen systems are also fitted with smoke masks. The replacement of aircraft oxygen system tubing, valves, and fittings is similar to the replacement of the same components in other aircraft systems. There is, however, an added emphasis on cleanliness and compatible sealant use. Any oxygen system component should be cleaned thoroughly before installation. Often tubing comes with leftover residue from the bending or flaring processes. Cleaning should be accomplished with nonpetroleum-based cleansers. Trichlorethylene, acetone, and similar cleaners can be used to flush new tubing. Tubing should be blown or baked dry before installation. Follow the manufacturer’s procedures for cleaning oxygen system components. Some oxygen components make use of tapered pipe fittings. This type of connection is usually sealed with the application of thread lubricant/sealant. Typical thread sealers are petroleum based and should not be used; only oxygen compatible thread lubricant/sealers should be used. Alternatively, Teflon® tape is also used on oxygen pipe fitting connections. Be sure to begin wrapping the Teflon® tape at least two threads from the end of the fitting. This prevents any tape from coming loose and entering the oxygen system.